Marquette and vicinity: Tonight, snow showers likely, mainly after 10 p.m. Mostly cloudy, with a low around 16. North wind around 15 mph, with gusts as high as 25 mph. Chance of precipitation is 60 percent. New snow accumulation of 1 to 2 inches possible. Wednesday, scattered snow showers before 2pm. Partly sunny, with a high near 27. North wind around 15 mph, with gusts as high as 20 mph. Chance of precipitation is 30 percent. Wednesday night, partly cloudy, with a low around 12. West wind 5 to 10 mph. Extended forecast: Thursday, mostly sunny, with a high near 36. South wind around 5 mph. Thursday night, a 50 percent chance of snow after 2 a.m. Partly cloudy, with a low around 29. Friday, snow before noon, then rain, possibly mixed with snow between noon and 3 p.m., then rain after 3 p.m. High near 37. Chance of precipitation is 80 percent. Friday night, a chance of rain before 9 p.m, then snow likely. Mostly cloudy, with a low around 28. Saturday, snow likely, mainly before 2 p.m. Partly sunny, with a high near 35. Saturday night, a chance of snow before 2 a.m. Mostly cloudy, with a low around 20. Sunday, partly sunny, with a high near 36. Lake Superior: Tonight, north winds 10 to 15 knots. Partly cloudy with isolated snow showers. Waves 1 to 2 feet. Wednesday, northwest winds 10 to 20 knots. Partly cloudy. Isolated snow showers through early afternoon. Waves building to 1 to 2 feet. 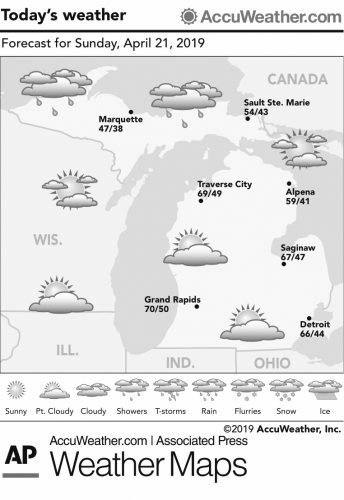 Temperatures: The average temperature Monday at the National Weather Service office in Negaunee Township was 13 degrees, 10 degrees above/below normal. The high Monday was 18 degrees and the overnight low was 8 degrees. Precipitation: Monday, .13 inches. Year to date, 5.45 inches. Normal to date, 5.78 inches. Snowfall: Monday, 3.7 inches. Season to date, 134.3 inches. Normal to date, 169.3 inches.